We’re back! We spent time abroad, off the grid –away from email, Facebook and our blog–with some of our best friends, seeing a fascinating new corner of the world. We came back revived, our eyes opened, and something I am calling our “sea mind” awakened. We had a superb vacation. We remain fully inspired by our travels upon arriving home. At the same time, an 18 hour travel day to get here, Bjorn’s suitcase spending the night in Paris without us and diving back into work jet-lagged has had us in “catch up” mode for a little while. 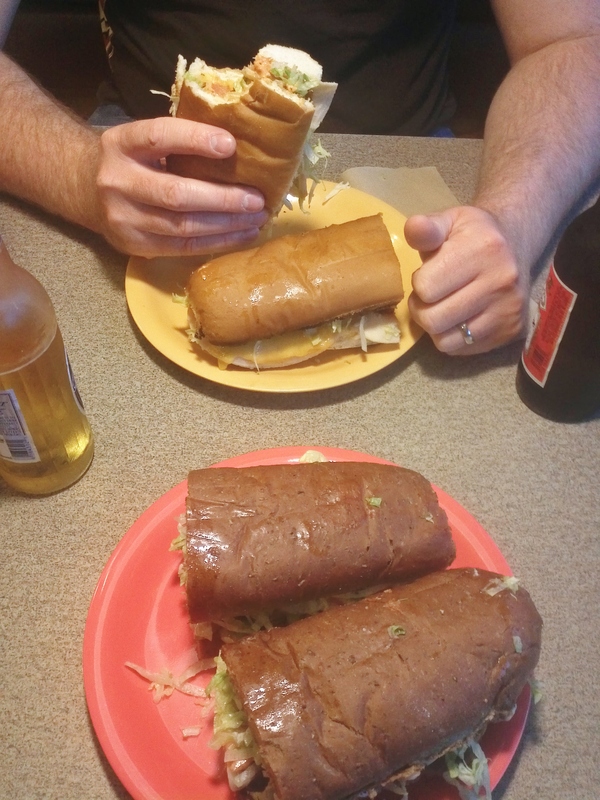 Our “welcome home” meal was a good old sub sandwich, a Hot Hoagie from Davanni’s, to be exact. Davanni’s is a low-key pizza and hoagie joint that started in our neighbourhood in 1947. They deliver, so we are frequent customers. This particular evening, we dined in. We both ordered our go-to sandwich, a Turkey Bacon Chipotle for Bjorn and a Veggie on wheat for me. We enjoyed these tasty, simple sandwiches served on a plastic plate and washed them down with a bottle of 3.2 beer. Travel and time with friends clears out mental fog, reminds us of who we are and want to be, renews appreciation and gratitude for friends, our house and garden, our lives, our hobbies, traveling, jobs and family time immeasurably. I plan to share it! To make that easier, in development are a dedicated Facebook page, a private host for the blog, and a renewed desire to enjoy life to the fullest and keep it simple. We’re glad to be back. This entry was posted in Beer, Dining Out, Easy, Omnivore, Our Garden, Our Home, Travel, Vegetarian and tagged 3.2 Beer, Davanni's, Hot Hoagies, Travel, Turkey Bacon Chipotle by Our Way to Eat. Bookmark the permalink. It was fun to hear about your family (especially Asa) from my Mom and Alice after Lyn’s party. It is great to hear you look forward to my blog! I hope you keep coming back. Woah, sounds so awesome (your sandwich too)! I am totally jealous of your adventure. We are gearing up to head over to Ireland in a few weeks, you’re post has got me all amped up to go. Can’t wait to hear details of your trip. I am working on a short series of blog posts about my trip. I have so many great pics it is a little bit overwhelming to get it narrowed down to a short series, since I’m thinking 12 trip posts would be too many… Ireland is awesome! Take lots of pictures! (Duh). Summer is just the best, travel, gardens, BBQ’s. This is blogger paradise.